The RD-M786 Rear Derailleur ushers in Shimano's new direct mounting system and incorporates the XTR group's Shadow Plus technology while offering the same impressive blend of performance and durability that riders have come to expect from XT. The direct mount design is compatible with newer frames from some of the cycling industry's leading manufacturers while remaining back-compatible with traditional hangers. This feature allows the derailleur to sit about 25mm further back than previous designs, where it's less exposed to impacts along the trail. It also creates a stiffer interface between the derailleur and frame and allows for faster wheel changes, particularly on bikes using thru-axle systems. The XTR-derived Shadow Plus system adds a stabilizer switch which can be enabled to increase spring tension and eliminate chain slap over rough terrain. Once disabled, the switch slackens back to standard spring tension, allowing for quick and easy wheel removal. Like last year's standard Shadow model, the Shadow Plus cage is tucked out of the way, furthering the derailleur's ability to clear trail obstacles like roots and rocks. 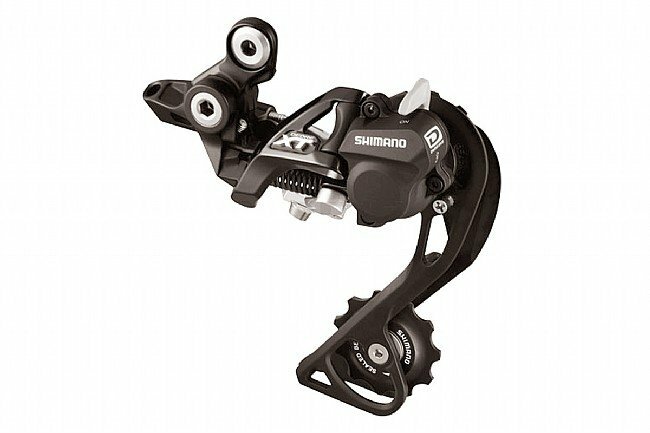 Also like its predecessor, this XT derailleur uses a slightly longer arm length for greater mechanical advantage. This gives the shifter more control over the derailleur spring for crisp, reliable shifting in all conditions. And of course, low maintenance sealed pulley bearings keep out mud, dirt and grime. The Deore XT RD-M786 Rear Derailleur is designed for Shimano Dyna-Sys 10-speed MTN drivetrains/shifters. Available in GS Mid-Cage or SGS Long-Cage models. A removable B-Link is pre-installed for compatibility with standard derailleur hangers. Black finish. Actual weight: 257g (GS with B-Link).